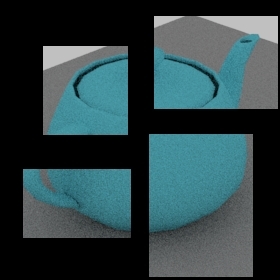 Render Region – 3DS MAX scripted RenderEffect. Some of renderers such as Arnold or Mental Ray after render finished clear outside area, so you lose previous rendered parts of image in VFB. Render Region restores cleared area of last rendered image. Clear – Clear internal RR buffer. Paste – Paste image from image clipboard to RR internal buffer. In VFB image will be shown after render. View – Display image from internal RR buffer. Maxscript (.ms) should be placed in maxroot\Plugins folder, and are then accessed through the “Effects” menu in 3dsmax. v1.1.1 (24.12.2016) – Fixed region detection when HightDPI 125%. v1.1.0 (22.11.2016) – Added 3dsmax 2017 support with HighDPI fix. 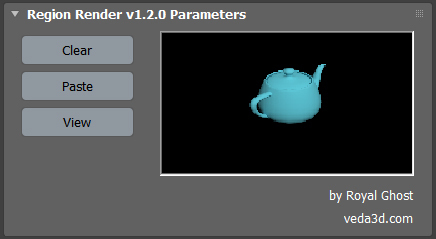 v1.0.0 (20.10.2007) – Added 3dsmax 2008 support.